Is our decision making rationally or emotionally based? Applying Snowden and Boone’s framework to the family business system is a diagnostic method that allows the consultant a better perspective to determine the level of complexity she/he is facing. In this process, it is crucial to understand that the system is not just a simple sum of its parts. On the contrary, it is the relationships within the system that cause the family business decision-making process to exhibit such complexity. I find this model very useful because it is specially designed for the leaders, both family members and their advisors, who understand that the world is often irrational and unpredictable. The Cynefin helps them sense which context they are dealing with in order to make better decisions. It is the consultant’s role to exercise personal affinities and professional abilities to help the system reach lower complexity levels. Where the family business consultant’s work is mainly productive, is within chaotic, complex, complicated and simple contexts. In a chaotic context the relationships between cause and effect are impossible to determine because they shift constantly and no manageable patterns exist. The best strategy for handling problems in a chaotic context is to act fast hoping to change the situation by stabilizing the events and relations that generate them. There is not much space or time for analysis as this context requires immediate action, but the consequences are hardly predictable and the consultant engaged in this practice can be seriously compromised if a negative outcome is produced. Therefore, it is recommended that the consultant think twice before engaging at this level. A complex context requires a more experimental mode of approach. It is also the most common context within the system because of the changes that constantly introduce unpredictability and flux to the organizational structure. The only way to understand what is happening is by doing a retrospective analysis. In this way, the consultant can get to know the past in order to understand the patterns that emerge and repeat within relationship and communication dynamics. This is a context where understanding WHY is crucial to determine WHAT to do. This context requires creativity from the consultant’s side and patience and confidence from the client’s side in order to move the conversations towards the lower level of complexity. The complicated context is where the consultant’s help is generally required because there is still a relationship between cause and effect, although not everyone can see it. In order to identify that relationship, however, the consultant needs to do an extensive analysis that will eventually lead to several good practices that can apply as a family strategy. The consultant’s main challenge here is to identify the best practices and guide the family toward implementation. One of the main dangers within the complicated context is the entrenched thinking. The consultant must be open, listen, and respect all ideas – even those he/she might consider controversial — in order to allow the new patterns to emerge, thereby broadening the range of options in the decision-making process. It will take time, but by understanding HOW these patterns work and influence the system, the consultant can guide the family business towards the simple context. Finally, the simple context is characterized by stability and clear cause and effect relationships. Once being reached and properly assessed, it requires straightforward management and monitoring. It means getting to the level where leaders can sense, categorize, and respond. In other words, where leaders can feel the momentum of personal relevance and, if truly committed, push themselves and the rest of the business family towards the results. In this context, the consultant’s engagement will focus more on monitoring and evaluation, than on decision making. Although this context is characterized by stability and clear cause and effect relationships, it’s not surprising that it lies adjacent to the chaotic context. 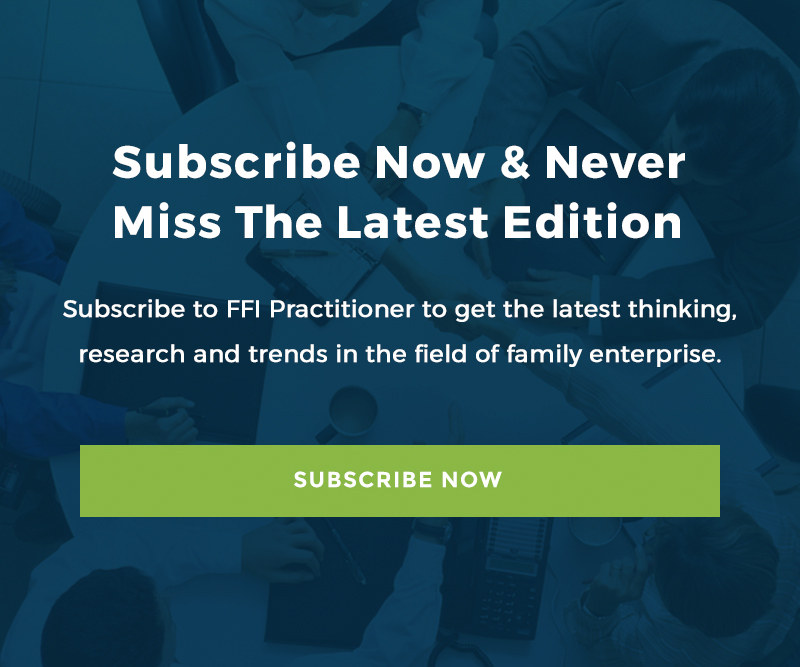 This is due to the complacency that often follows success, creating yet another challenge for the consultant, i.e., to manage the leaders’ awareness of the perils they face in the constantly changing and complex family business system. One large family business is dealing with a very complex dilemma: diversify or focus on the core business. It is a very solid business with a high percentage of the national market share and important regional presence. It is currently run by the second generation. With the founder retired from all the executive tasks, there is a struggle for control and power among the 2nd generation leaders that converts to a complex balancing act in which two of the three family branches clearly stand on one side of the dilemma, intent to get the third branch’s vote in their favor. This dilemma (diversity or focus on the core business) has become the central issue monopolizing the family members’ communication and affecting the business decision-making process. Many pros and cons have been stated regarding the dilemma and it has become clear that nothing can be solved until the communication channels are cleared. Although the presenting issue is the difference between diversification or tradition, below the surface, the entire family system has been mobilized to transmit encrypted messages addressing a more important issue: family unity. The first step towards getting to a solution was to resolve the emotional-relational channels obstructed by jealousy and mistrust that has held the family hostage. At this point, it was clear that the complex context within the family business was the family. Therefore, it was essential to lower the complexity level from complex to simple. To do so, it was important to highlight the importance of reconciliation with the past in order to arrive at a sustainable future and to define the communal wealth and business strategic plan — keeping in mind the two options: together or separate. At this point the emphasis was placed on the legitimacy of both possible outcomes, as long as the process that led to the decision was based on respect and open dialogue. Also, the leaders were instructed to distinguish clearly when a determined context was being handled. In other words, when any particular issue was addressed, did it correspond to a family, business or wealth context? With the help from the consultant, the family stepped down from the complex to the complicated level. A new family agreement established a five-year period to put aside the personal differences and work on the common strategic plan. This is still far from reaching the final goal. However, it is an important step towards the simple context that is characterized by stability and clear cause and effect relationships, easily discernible by everyone (Snowden & Boone, 2007). Reaching it has made the decision-making process much easier. Within each family business there are three main contexts in which all of the situations are placed: family, business and wealth. Each single context is determined by the nature of its purpose and the nature of the relationships among the elements that generate the interactions within the system. At the same time each context has its own level of complexity. Determining the context complexity level within each family business circle helps narrow the options in the decision-making process to several plausible good practices that the family business leaders have the capability and resources to implement in order to stabilize the system. The consultant’s role is to analyze the present situation, facilitate these practices and guide the family towards and through the simple context. 1. The term was chosen by the Welsh scholar Dave Snowden to describe a perspective on the evolutionary nature of complex systems, including their inherent uncertainty (“The Cynefin framework”). The name serves as a reminder that all human interactions are strongly influenced and frequently determined by our experiences, both through the direct influence of personal experience, as well as through collective experience, such as stories or music.